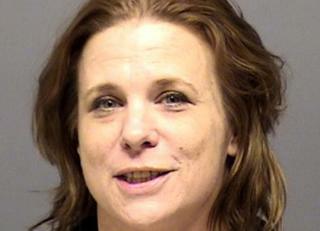 An Oregon woman has been jailed after her inmate boyfriend died following a kiss the two shared to conceal the transfer of drugs into a prison. Melissa Ann Blair kissed Anthony Powell last year to pass seven balloons filled with methamphetamine into his mouth. Two balloons later ruptured in his stomach and he died of methamphetamine toxicity, prosecutors said. A US judge said both Powell and Blair were to blame for the death. "It was tragic and sad but he shares responsibility for what happened," US District Judge Marco Hernandez said of Powell. The 41-year-old inmate was serving a life sentence for aggravated murder in the death of his mother-in-law, who was stabbed, according to court records. Blair, 46, was visiting her boyfriend at the Oregon State Penitentiary on 2 June 2016 when she passed the drugs. A lawyer for Blair said she had felt coerced into the scheme even though Powell was behind bars. "It was a very Svengali-type situation where he had total control over her life," John Ransom said. "She had to do whatever he said." Judge Hernandez sentenced her to two years in federal prison on a drug conspiracy charge. She must also complete three years of post-release supervision as well as seek drug and mental health treatment. A friend of Powell, Brandy Pokovich, told the Associated Press news agency that she introduced him to Blair. She said she helped Powell find girlfriends while he was incarcerated through her social media accounts. Four other defendants in the case have pleaded guilty to drug conspiracy and are expected to be sentenced in the coming weeks.